The party traversed Suter descending the Falls Creek-Hollyford ridge line. The crest of this ridge was climbed by JH Christie and T Moore in Oct 1933. Dal Ryan, Colin Lea, Jan 1960. A diagonal line up to the left to gain the summit ridge. Bill Gordon, Ralph Miller, Noel Dunlop, Morrie Davis, Mar 1959. From upper Falls Creek around 1000m contour, obvious valley to ridge top snow-ice gully with no escape. Probably below spot height 1762m on south side of the East Ridge of Mt Suter. Steep pitch near mid height. Descend by heading east down ridge and down climb gully systems to valley. Good bivi cave in valley. Craig Jefferies. 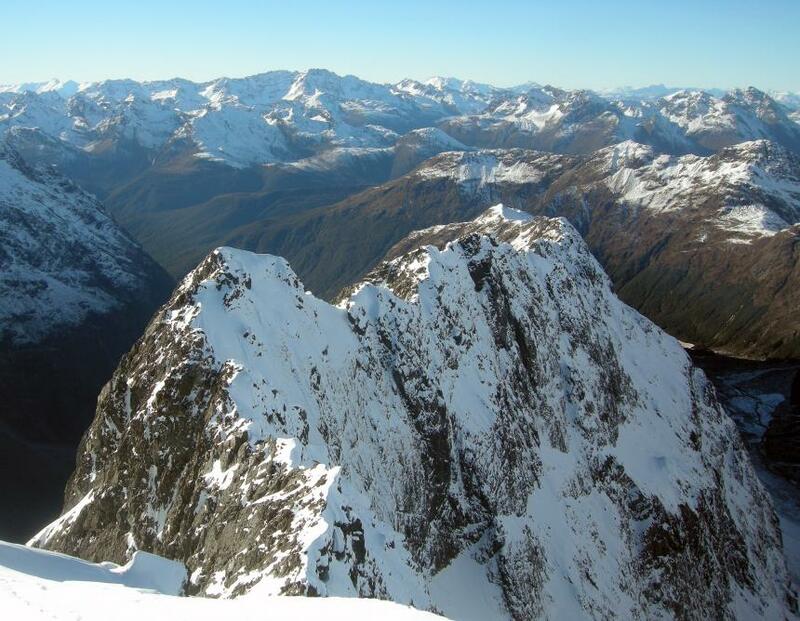 http://climber.co.nz/news/first-ascent-south-face-mt-suter. Kester Brown. Stephen Skelton.